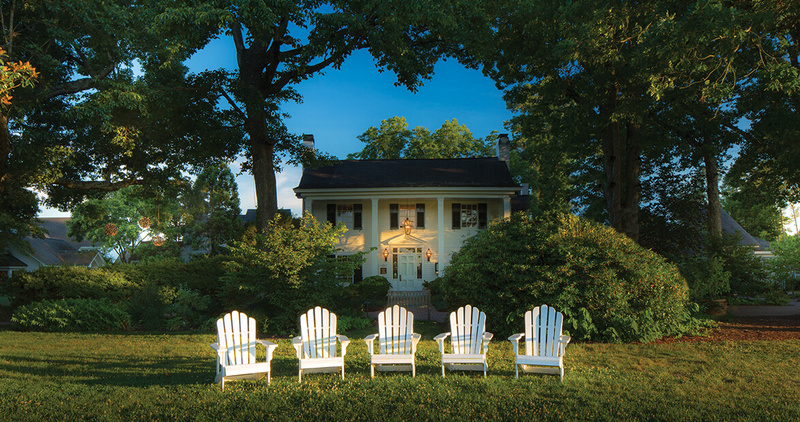 Embracing the five Cs of hotel hospitality — character, courtesy, calm, charm, and cuisine — comes easy at Pittsboro’s Fearrington House Inn. 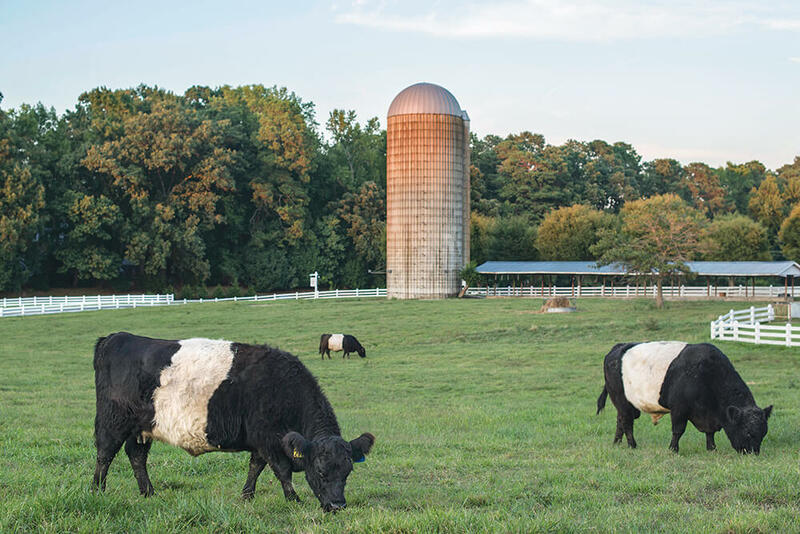 The way you know you’ve landed at the Fearrington House Inn is by the black-and-whites — the famed Belted Galloway cows lounging in the shade of a silo. Both cows and silo have been enduring symbols of Fearrington, both have been rendered in a tiny, 1-inch, pen-and-ink ad that’s been appearing in The New Yorker since 1983. For at least that long, the Fearrington — a collective name for an inn, spa, restaurant, wedding venue, and walkable village of shops and eateries — has been attracting interesting intellectuals from all over to its neighborhoods. The name “Fearrington” is no marketing ploy; it’s the original, real-deal name. The Pittsboro farm had been in the Fearrington family for 60 years when R.B. Fitch and his wife, Jenny, purchased it. 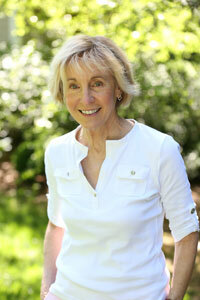 They began building a dream fostered during R.B.’s stint in the Air Force. While stationed in England, he fell in love with the look and scale of English country towns. And that’s the setting for Fearrington. It doesn’t aim for the blowout, jaw-dropping, effect. (Hence, while the belted black-and-white goats, called Tennessee fainting goats, will fall over when they’re frightened, you won’t.) The inn is comfortable with genteel simplicity, spacious without sleek modernity, romantic without being rustic, chic and yet historic, and personally attuned to guests without being overbearing. Relais & Châteaux, the organization that oversees a network of boutique independent hotels, including Fearrington, is an exclusive club with very specific standards for admittance, known as the five Cs: character, courtesy, calm, charm, and cuisine. The same ideals, come to think of it, that North Carolina embodies, no? At Fearrington, the five Cs are embodied in the small but important details, such as the luggage carts. They are wide, with a rear railing so there’s no risk of your suitcase sliding off and upending, even though my “suitcase” is an old L.L. Bean bag that the inn employee doesn’t look askance at, but places right onto that luggage rack as if I were toting Louis Vuitton. The welcome pack in your room contains Jelly Bellys, Ghirardelli chocolate, and potato chips. See? No intimidation there. And though I have no idea what Seamoss Stress-Relieving Hydrosoak is, its green, grainy blossoms float in the water of a monster bathtub with press-a-button jets. And hello to you, too, ladybug wending your way up the porcelain side. After all, Fearrington is a farm. A farm in North Carolina, which is ladybug central. And because, after all, the bathroom’s Roman shades are printed with ladybugs. Why not just sit on your personal, screened-in porch perch and study the pastoral scene, or Jenny Fitch’s gardens, ranging from formal, with paths and trellises, to boxwood “knots,” planted and pruned to resemble giant roped knots, tidy as a bosun’s handiwork. Herbs, vegetables, and cutting flowers all grow here, for Fearrington to use. The pointy green leaves of a snake plant are the byproduct of a bird accident in my yard, but five full-time gardeners make sure that the plant growing at Fearrington is there because they want it there — and because the village is a certified Audubon-friendly locale, which encourages local birds by planting native species. The peaceful beiges and baskets and buckets of the “Swedish farmhouse” aesthetic of the spa beckon, where your pedi takes place in a big, oval, galvanized tin bucket made for washing dogs, or those early pioneers. And while you can come to Fearrington to read or ramble or relax (or for retail), there’s really no point in coming if you don’t dine at the Fearrington House Restaurant, under the direction of Executive Chef Colin Bedford. Housed in a 1927 Colonial Revival farmhouse, the establishment has earned the Five Diamond Award from AAA and a five-star designation from Forbes Travel Guide. Don’t let the menu intimidate you here, either: pheasant, octopus, velouté sauce, bavette pasta, and cipollini onions. When you call for a reservation, the staff asks questions aplenty, to determine whether the evening is a birthday or some other special event; whether you have dietary issues; whether you want a wine-tasting experience with your meal, and if so, whether you drink only white wine. As Holly Golightly might say, don’t you just adore a restaurant where they know your name and explain every dish placed in front of you? From the dainty welcome of a chilled cheese fondue with sour cherry juice and potato salad, in which the potatoes have been whittled to the size of a pea, on through the starter of a citrus-cured flounder (read: ceviche). Onward toward the braised sunchokes with Fearrington honey, and through the bacon-wrapped pheasant with pomegranate; right into the signature chocolate soufflé, created by Edna Lewis, one of Fearrington’s first guest chefs. Your server punctures the airy top of the soufflé, then pours hot chocolate into the hole, and adds a healthy dollop of whipped cream. It’s a wordless performance that will leave you speechless — yet still able to open your mouth and eat it. Don’t you just adore a restaurant where they know your name and explain every dish placed in front of you? Aren’t you glad that, back in the room, you remembered to hang the waffle-weave robe over the heated towel racks? Beside the bed is a pair of fresh, personal slippers for your poor, tired, pampered-in-the-spa feet, and a decanter of port to polish off the evening. Fall into the bed and onto the six pillows that are stacked upon the mattress made especially for Fearrington. If people can “stir” quietly, that’s what they do on Fearrington mornings. Take early morning walks. Walk early rising dogs. Catch an early cup of coffee and a newspaper at the deli-coffee shop known as The Goat. What of the cows? Of course, they are strictly pets. The Galloways cluster, nothing to worry about but chewing their cud. The goats don’t bother fainting at the sight of people anymore. And the chickens, also black-and-white, known as Lakenvelders ­— will never appear on any plate except in the form of poached, scrambled, or over-easy breakfast eggs, just feet away from where R.B. Fitch, 82, still comes to work every day, continuing what isn’t merely a fine hotel, but a way of life, a family, a philosophy, a village.